As I have done nothing but edit and re-upload ESP files for the purposes of compatibility, there is no content for me to gain permission to use or reupload under my own name. As such, I have no rights to grant you permission to edit and distribute the actual content (Textures, Meshes, Sounds, Animations, etc) contained within each modification. You must contact each individual mod author for permission. All of other mod authors who were instrumental in creating the wonderful mods we currently enjoy. Adjusted damage, weight, firing speed, reload speed, effective distance and object modifications to reflect Zzyxzz's intent. 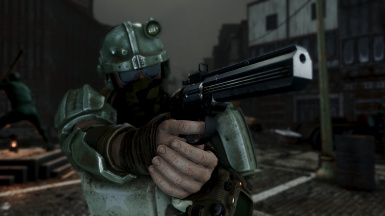 MP-412 will spawn on Generic Bosses, Raider Bosses, Gunner Bosses, High Ranking Gunners, Minute Men, Rail Road Agents, BoS Scribes, Vendors and can appear as Legendary weapons. 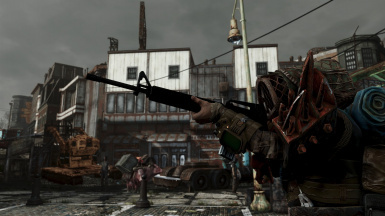 McMillan CS5 will spawn on Generic Bosses, Raider Bosses, 50% chance to spawn on Raiders, Gunner Bosses, Gunner Snipers, BoS Scribes, Railroad Agents, Minute Men, Vendors and can spawn as Legendary weapons. Glock 17-18 will spawn on Generic Bosses, Raider Bosses, Gunner Bosses, High Ranking Gunners, Vendors and can appear as Legendary weapons. 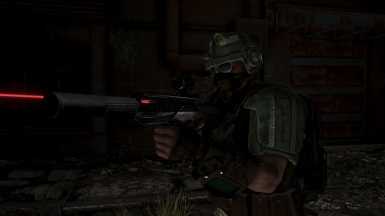 FAMAS Assault Rifle will spawn on Generic Bosses, Raider Bosses, Gunner Bosses, High Ranking Gunners, Minute Men, BoS Scribes, Vendors and can appear as Legendary weapons. 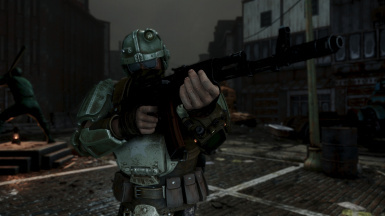 Added Wasteland Melody's Chinese Assault Rifle w/ animations by War Daddy. Requires the original modification and War Daddy's animation update. Added the Chinese Pistol (Mauser) w/ animations by War Daddy. Requires the original modification and War Daddy's animation update. Added the MAC-11 Machine Pistol w/ animations by War Daddy. Requires the original modification and War Daddy's animation update. Added the STG-60 w/ animations by War Daddy. Requires the original modification and War Daddy's animation update. The Chinese Assault Rifle will spawn on bosses around level 5 and on the rest of the factions and on vendors after level 10. The Chinese Pistol (Mauser) will spawn on bosses around level 5 on bosses and in pre-war luggage and safes (((Chinese Agents))). The gun will also spawn on Zao. The STG-60 will spawn on BoS, Gunners and Raider Bosses as well as on Specialty Vendors. 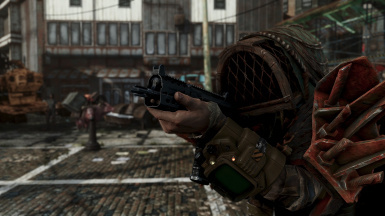 The MAC-11 will spawn on bosses around level 5 and on Raider, Gunner and Railroad faction members around level 8. This patch requires you to have "BLD-Leveled Lists.esp" installed. Overwrite when asked as this patch will overwrite that file with it's own. If you are installing this with a current save, you may need to wait a few days to see the changes come into effect. This is a leveled list edit and as such, will conflict with any other mod that might override the Diamond City leveled lists. Due to certain IRL issues and dedicating my time to other projects (some of them being Fallout 4 mods), this will be the last version of my patch repository until further notice. Zzyxzz does have access to this mod and can upload his own patches in the meantime. There are no major problems or anything like that, I just need to temporarily redirect my focus. Upload, edit and update patches. The purpose of this pack is to provide patches to popular weapon modifications so that they may be enjoyed with Better Locational Damage and Optional Gameplay Overhauls. I have used Zzyxzz's Guide as a reference with few changes that I felt made sense. Every pack will be conflict free, meaning that you can download and use all of them as they will not conflict with each other. I hope you enjoy it and if you don't find a patch for your favorite weapon modification, with a little time, effort, Fallout 4 Edit and the Creation Kit, you can make your own patches too! Step 2: Using Nexus Mod Manager, download and install the "Wasteland Melody Pack" in the "Main File" section under the "Files" tab. Overwrite when asked to do so. 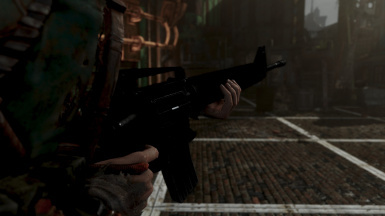 Wasteland Melody's Chinese Assault Rifle uses the Submachine Gun animation set and as a result, the reloading animation looks plain stupid. To correct that, I suggest downloading "Grab The Damn Mag!" Step 2: Using Nexus Mod Manager, download and install the "DeadPool2099 Pack" in the "Main File" section under the "Files" tab. Overwrite when asked to do so. Any and all "Bugs" present in the original mods are still present. 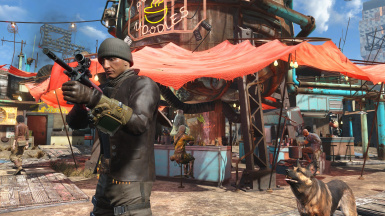 Push Dagger requires Automatron, Far Harbor and Nuka World. Creates a brand new leveled list and adds it to some melee and unarmed lists. May require a merge patch if you have other weapons that directly edit unarmed and melee leveled lists. Step 1: Using Nexus Mod Manager, download and install the following weapon modifications. Step 2: Using Nexus Mod Manager, download and install the "Ajhakra Pack" in the "Main File" section under the "Files" tab. Overwrite when asked to do so. FAMAS - You will notice that some Weapon Workbench features are missing. This is due to damage modifiers and other attachments belonging to the same keyword. As cheat damage modifiers are a "no, no" for Better Locational Damage, they had to go. But do not fret, you will see every single FAMAS variant spawn eventually. McMillan CS5 - I purposefully removed the Institute version from the leveled lists. I'm not sure if all faction paint jobs will spawn correctly, however I do know that you can apply whatever faction paint job you want at the Weapons Workbench. Step 2: Using Nexus Mod Manager, download and install the following animations, overwrite when asked to do so. Step 3: Using Nexus Mod Manager, download and install the "War Daddy Pack" in the "Main File" section under the "Files" tab. Overwrite when asked to do so. 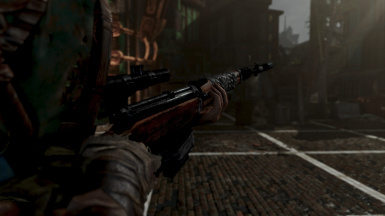 Chinese Assault Rifle - War Daddy has not made bash attack animations for the Chinese Assault Rifle, so it uses the vanilla Pistol Bash animation in first and third person. Not game breaking or anything, but it's something that you should know. STG-60 - The automatic fire mode seems to change fire rate on rare occasions. It's not something that I've noticed myself, but it was reported to me by War Daddy to be an issue present with the current version of this animation set. Once again, not game breaking, but it's something that you should know. Step 1: Using Nexus Mod Manager, download and install "Better Locational Damage and Optional Gameplay Overhauls" and make sure to select the option for "BLD-Leveled Lists" prior to completing the installation. 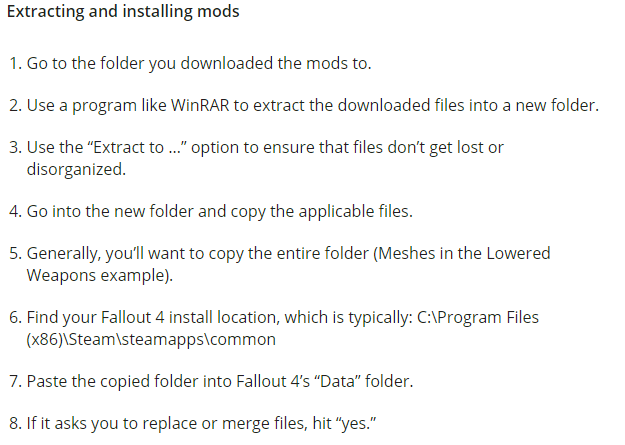 Step 2: Using Nexus Mod Manager, download and install "Diamond City Armory Expanded" and overwrite when asked to do so. 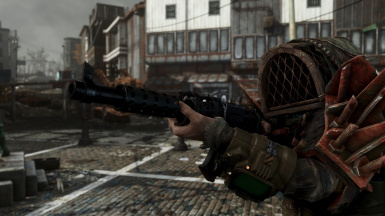 This patch aims to correct Bethesda's boneheaded decisions on Muzzle attachments for various firearms. All of the changed weapons will now have a default noise profile of "Normal"
Attaching a Compensator will change the noise profile to "Loud"
Attaching a Muzzle Brake will change the noise profile to "Very Loud"
Attaching a Suppressor will change the noise profile to "Quiet"
All Muzzle Attachments will no longer have a range or damage penalty with one exception. 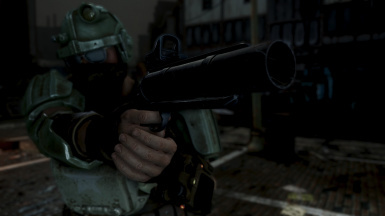 The Deliverer now uses an experimental "Covert Operations" suppressor which allows for silent operation, but the cost of it's "Silent" noise profile is a minor drop in effective range and a 10% damage reduction. 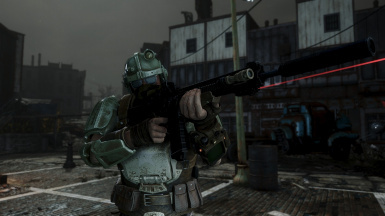 The Deliverer is now the only ranged ballistic weapon in Fallout 4 with the "Silent" noise profile. Attachment descriptions edited to reflect changes made. None that I've been able to track so far. Please let me know if this patch causes any sort of AI Retardation. AK74M, Krebs AK, Mosin-Nagant, AS VAL and VSS Vintorez, SVU Sniper Rifle, MP-443 Grach and OTs-33 by FX0X01. The AKM Assault Rifle by ngabber. SORRY FOR THE LONG WAIT! A bunch of IRL stuff took up my time and I've also been working on a Survival Modification of my own. Due to this, the above packs are the only patches that I'm going to be working on for the time being. Any and all other patches and updates will come directly from Zzyxzz afterwards.